Sushi may feel like a popular food fad in America, but in Japan, this subset of food preparation is centuries old and steeped in tradition. 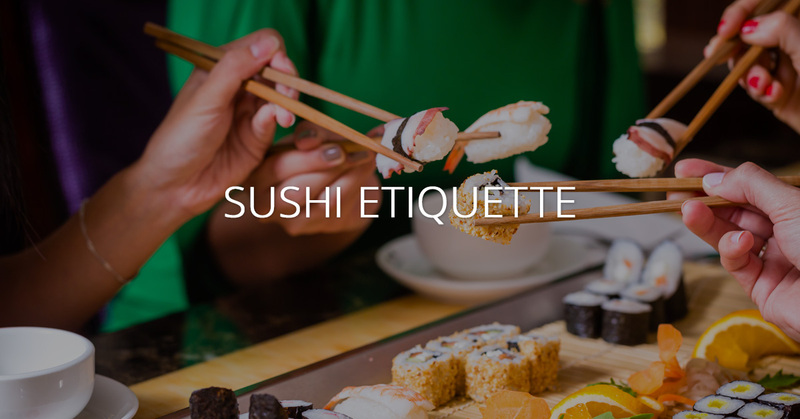 If you’re new to sushi (or just want to learn more), there are a few etiquette rules to follow that differ from your average restaurant. Follow these easy guidelines the next time you go out for sushi. In many sushi restaurants, there will be a bar at which you can watch sushi being prepared as well as the standard dining tables. If you would like to converse with the sushi chef, watch your meal be prepared, and so on, choose to sit at the bar, if there are seats available. However, if you don’t feel like making conversation with the chef, ask for a table. When sitting at the bar, feel free to ask questions about preparation techniques, knives being used, or anything else that interests you—just don’t ask which fish is fresh! Instead, ask what the chef recommends, or even ask them to guide your sushi menu choices. It may seem like it, but those flimsy wooden chopsticks are highly unlikely to give you splinters. Rubbing wooden chopsticks together can be considered insulting to the proprietors of the restaurant, as it questions the quality of the products they provide. 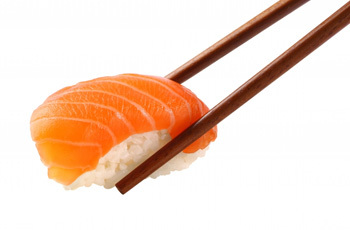 However, if you’re still learning the fine art of chopsticks, it is permissible to eat your sushi with your fingers. That’s how sushi started, after all! Sashimi, on the other hand, should be eaten with chopsticks because it isn’t served with rice. Unlike so many other restaurants, at a sushi house, proper etiquette is to eat your sushi as soon as it is delivered to you rather than waiting for all the food to arrive. The sushi chef is taking the time to prepare each roll as beautifully as possible so the flavors are all perfectly balanced and fresh. There’s even a method to warming the fish ever so slightly by hand, and letting your sushi sit there puts all that work to waste. In addition, when eating your sushi roll, don’t drown it in soy as this is an insult to the sushi chef’s skill. If you feel the need for a bit of soy, pour a light layer of soy into the bowl and dunk fish side down. This prevents the rice from absorbing too much soy. Eat each roll in one bit and enjoy your nigiri fish side down so the fresh, pure fish flavor hits your tongue first. Sushi is generally served with wasabi and pickled ginger. Even if you love spice, don’t overload your sushi rolls with wasabi; this is viewed as an insult to the flavors your sushi chef has perfected. Similarly, don’t plop a slice of pickled ginger on top of each sushi roll. Pickled ginger is meant to be a palate cleanser in between courses or different types of rolls. If you’re ready to experience the traditional art of sushi at its finest, visit us at Sushi Joa in Mercer Island today!